DCDC hosts Water/Climate Briefings on a regular basis. These briefings are a regular forum for the water-policy community, DCDC researchers, and students to exchange knowledge and ideas. The typical format is a panel of experts and community partners discussing issues such as the urban heat island, water re-use, and the energy-water nexus, followed by audience participation and questions. Since the launch of DCDC, we have hosted four to seven briefings each year, with panelists representing the scientific and professional perspectives. Guests joined us for an interactive discussion on the efforts to transition urban areas to new solutions for managing stormwater as a beneficial use within the urban environment while maintaining flood resilience. 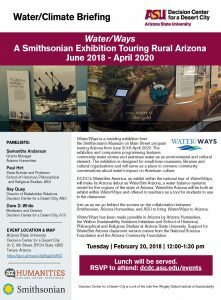 Water/Ways is a traveling exhibition from the Smithsonian’s Museum on Main Street program touring Arizona from June 2018 April 2020. The exhibition and companion programming features community water stories and examines water as an environmental and cultural element. The exhibition is designed for small-town museums, libraries and cultural organizations and will serve as a place to convene community conversations about water’s impact on American culture. The relationship between land use and water use has not been a past focus of academic or professional research or policy development. However, as academic and professional attention has been shifting to outdoor water demand, the relationship between land use and water use has gained more attention. 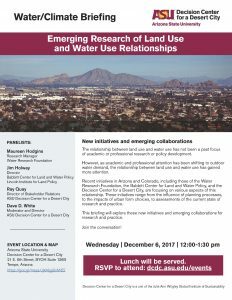 Recent initiatives in Arizona and Colorado, including those of the Water Research Foundation, the Babbitt Center for Land and Water Policy, and the Decision Center for a Desert City, are focusing on various aspects of this relationship. These initiatives range from the influence of planning processes, to the impacts of urban form choices, to assessments of the current state of research and practice. This briefing explored these new initiatives and emerging collaborations for research and practice. Non-governmental organizations (NGOs) are also playing an important role in water management of the Basin. NGOs range from representing agricultural water consumers, working to restore the Colorado River Delta, to working with farmers to manage water withdrawals more sustainably. The panel explored the nature of NGOs role in water management of the Colorado River Basin and why water management is being done by NGOs as opposed to governmental or for-profit institutions. DCDC continues to explore, through research and engagement, the wide range of water management strategies that will be needed to achieve water sustainability within the Basin. This network intersects around both supply and demand and a key aspect of sustainability is institutional resilience to keep supply and demand balanced over the long-term. Understanding the dynamics of demand is essential for adapting to changes that occur in this systems network. 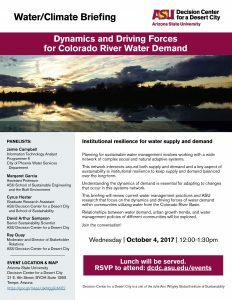 This briefing reviewed current water management practices and ASU research that focus on the dynamics and driving forces of water demand within communities utilizing water from the Colorado River Basin. Relationships between water demand, urban growth trends, and water management policies of different communities were explored. In the State of Pernambuco, Brazil, there is nearly universal water supply access via household connection in the urban areas. Despite this access to water, many water challenges still exist including intermittent water delivery, lack of water sanitation, excessive groundwater pumping, no regulation for wastewater and general water pollution, and the challenge of balancing the water system during times of high floods and droughts. 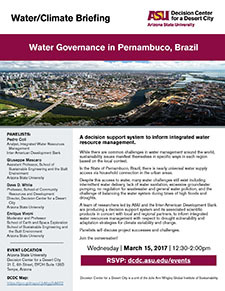 A team of researchers led by ASU and the Inter-American Development Bank are producing a decision support system and its associated scientific products in concert with local and regional partners, to inform integrated water resources management with respect to drought vulnerability and adaptation strategies for climate variability and change. Arizona is home to twenty-two Native American tribes located around the state. With different geographical locations, water needs and water supplies, these tribes have both similar and unique perspectives and challenges to water security. 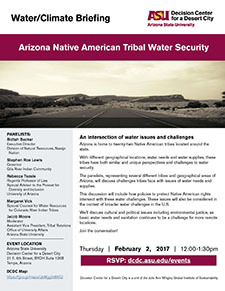 This discussion will include how policies to protect Native American rights intersect with these water challenges. These issues will also be considered in the context of broader water challenges in the U.S. We’ll discuss cultural and political issues including environmental justice, as basic water needs and sanitation continues to be a challenge for more remote locations. 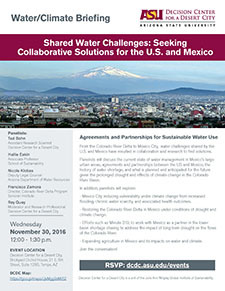 Panelists will discuss the current state of water management in Mexico’s large urban areas, agreements and partnerships between the US and Mexico, the history of water shortage, and what is planned and anticipated for the future given the prolonged drought and effects of climate change in the Colorado River Basin. Mexico City reducing vulnerability under climate change from increased flooding, chronic water scarcity, and associated health outcomes. Restoring the Colorado River Delta in Mexico under conditions of drought and climate change. Efforts such as Minute 319, to work with Mexico as a partner in the lower basin shortage sharing to address the impact of long-term drought on the flows of the Colorado River. Expanding agriculture in Mexico and its impacts on water and climate. Holistic approaches to urban water governance in Delhi, São Paulo, and Johannesburg. 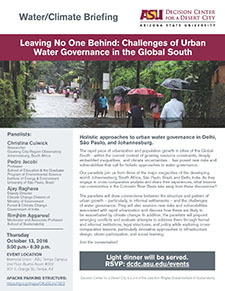 The rapid pace of urbanization and population growth in cities of the Global South – within the current context of growing resource constraints, deeply embedded inequalities, and climate uncertainties – has posed new risks and vulnerabilities that call for holistic approaches to water governance. Our panelists join us from three of the major megacities of the developing world: Johannesburg, South Africa, São Paulo, Brazil, and Delhi, India. As they engage in cross-comparative analysis and share their experiences, what lessons can communities in the Colorado River Basin take away from these discussions? The panelists will draw connections between the structure and pattern of urban growth – particularly, in informal settlements – and the challenges of water governance. They will also examine new risks and vulnerabilities associated with rapid urbanization and discuss how these are likely to be exacerbated by climate change. In addition, the panelists will pinpoint emerging conflicts and evaluate attempts to address them through formal and informal institutions, legal structures, and policy while exploring cross-comparative lessons, particularly innovative approaches to infrastructure design, citizen participation, and social learning. Confronted with rapidly growing populations, increasing climate stress, and uncertain supplies of natural resources, the liveability of urban environs is seriously challenged. Conventional, centralised, technical infrastructure systems, such as urban water and energy, are increasingly ill-equipped to meet these challenges, or to build the resilience that will safeguard our urban spaces as multifunctional, socio-cultural, and aesthetic spaces affording people safe and healthy lifestyles. Building such resilience requires a fundamental shift in environmental governance practices, which raises a core question: How can we best support this change? An emerging response lies in the view we can actively steer or facilitate a sustainability transition. 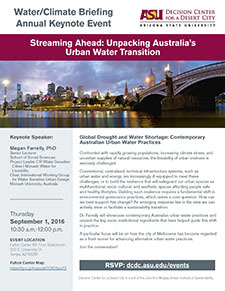 Dr. Farrelly will showcase contemporary Australian urban water practices and unpack the key socio-institutional ingredients that have helped guide this shift in practice. A particular focus will be on how the city of Melbourne has become regarded as a front runner for advancing alternative urban water practices. In summer 2015, DCDC was awarded a renewal from the National Science Foundation that effectively launches the next wave of our research, education and community outreach. Thanks to this new $4.5 million investment, DCDC will expand on the last decade of scholarship on water sustainability and climate adaptation beyond Phoenix to include other cities dependent on water from the Colorado River Basin. 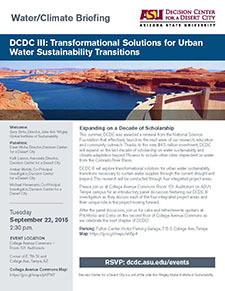 DCDC III will explore transformational solutions for urban water sustainability transitions necessary to sustain water supplies through the current drought and beyond. This research will be conducted through four integrated project areas. The Colorado River and its tributaries provide a range of ecosystem services, contributing to municipal water supplies for nearly 40 million people in seven western states, irrigating millions of acres of farmland, generating thousands of megawatts of electrical capacity for the region, and providing critical habitat for threatened and endangered species. While the region has thus far avoided an official declaration of water shortage on the Colorado River, significant challenges remain. Together, the states of the Colorado River Basin are developing strategies to address issues including drought, groundwater management, climate variability, and infrastructure needs. 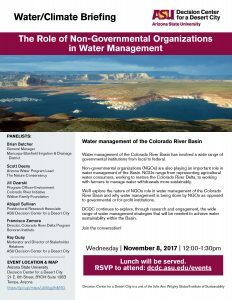 So the question remains: can an over-allocated Colorado River Basin achieve water sustainability? Policy leaders from Arizona and Colorado will discuss this question as they explore existing and possible future innovative and collaborative solutions to water sustainability that will ensure continued social, economic, and environmental vitality for the West. 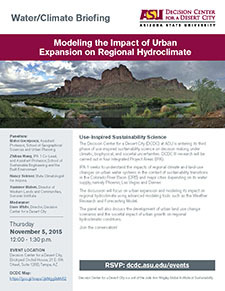 IPA 3 will use simulation modeling and visual analytics of biophysical and socioeconomic drivers of regional water-systems to compare and evaluate sustainable water management strategies for Denver, Las Vegas and Phoenix. This will include incorporating the biophysical hydroclimate modeling of IPA 1, the social and institutional drivers of water use and decision making being explored by IPA 2, and the initial conceptual structure of sustainable transition strategies that will be explored by IPA 4. The panel explored the existing state of water system modeling for Denver, Las Vegas and Phoenix, the possible options for comparative modeling between the three regions, and the potential inputs, output metrics, and scenarios being considered by the other IPAs. In IPA 2, we’ll research how residents, institutions, and economic dynamics shape urban water systems and the implications for sustainability transitions by comparing the cities of Phoenix, Las Vegas, and Denver. This comparison will include a residential survey of risk perceptions, attitudes, and behaviors. DCDC will explore pathways for overcoming social, political, and economic barriers to transitions. During the Water/Climate Briefing, the panel discussed opportunities and constraints for water sustainability under climate change and other long-term environmental risks. 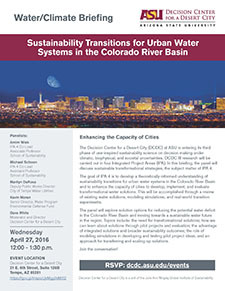 Integrated Project Area 1 seeks to understand the impacts of regional climate and land-use changes on urban water systems in the context of sustainability transitions in the Colorado River Basin and major cities depending on its water supply, namely Phoenix, Las Vegas and Denver.